The pianist Tom Selznick is forced to stop with performing because of a crippling stage fright. Just before his comeback, he discovers a note being written on his sheet. His return appears to contain a deadly side, when he’s forced to play for his life. Got your attention, don’t disappoint me Tom. “Grand Piano” is not so grand after all. 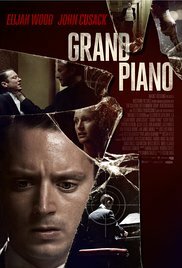 Are you a admirer of Elijah Wood, you hate the presence of John Cusack in a movie, you’re a lover of classical music, it shouldn’t be to exciting and certainly not to many victims with gallons of blood, then you should watch this movie. I was extremely bored anyway. 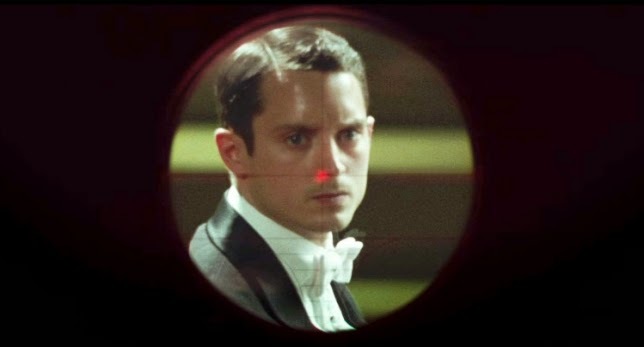 So if you are a big fan of Elijah Wood, then you’ll definitely enjoy this movie. He’s almost full time on screen. His famous frightened look with these wide open eyes is constantly in the picture. You can truly smell his cold sweat as the story progresses. The most amusing description that I have encountered so far is “Phone Boot with Frodo playing the piano.” I expected that he would put on his Hobbit costume and head back to Bag End with his knapsack, cursing at everyone that he’s sick of strumming on that rotten grand piano. It’s a pitty, but that label from LOTR will always stick to him. It’s not 100 % fair to use that argument again because I have to admit that he’s actually playing his part in an excellent way. His greatest achievement in “Grand Piano” is that I was really convinced at one time that he could have played this concerto completely on his own. After some searching on the worldwide web, I read that he did play the piano once, but that this level was really to high for him. As he said in an interview : “I had taken lessons as a child and had a basic understanding of the instrument, but I certainly could not play like that . And I wanted it to look as accurate as possible . But at a certain point , once we kind of broke the barrier , so to speak , or the first couple of bits or playing the piano onscreen , I felt like I’d got myself into a routine or how to make it work and got comfortable with the instrument and comfortable with the process.” But beyond the excellent “pretending to be a masterful pianist”, there is very little to see. Looking anxiously around, conversing while playing a terribly difficult piece of music and even typing a text message through his score, are some wonderful performances. Wonderfully but at the same time slightly impracticable. About John Cusack, we can be as brief as his contribution to this would-be suspense thriller. The entire film we can hear only his conspiratorial and fairly pedantic voice. Actually I forgot he starred in here after a while and had a reaction like “Oh yes, he was also in this movie” when he finally showed up. Very little to judge about. One positive thing for Cusack is the fact that the critics have very little to complain about . The biggest stumbling block for me was the music. Ultimately, it seems like you ‘re watching a full broadcast of some classical concert or competition instead of a so-called thriller. Not that I want to be detrimental to this kind of “serious” music, but I never managed to like this kind of music, even though I am a big music lover and I am open to multiple genres. It started to work on my nerves in such a way that I was looking more and more forward to the end and waited impatiently for the first victim. A total disappointment for me. The most positive portrayal was from Tamsin Egerton and Allen Leech as Ashley and Wayne, the friendly couple of the Selznick’s. A couple so stupid and so ignorant of classical music that they stood out from the crowd of stiff connoisseurs. The only thing Ashley is wondering about was the fact that she couldn’t sit with her ​​best friend Emma although there was still plenty of room on the balcony after she had studied the plan of the concert-hall. Hilarious. I wished the sniper shot Selznick’s wife Emma immediately. What an arrogant and obnoxious person she was! Next time someone has a heart attack during the Queen Elizabeth contest here in Belgium, there will be more tension in the live broadcast than there was to be found in this film. And now “Allegro assai” and certainly “Prestissimo” on to the next movie ….